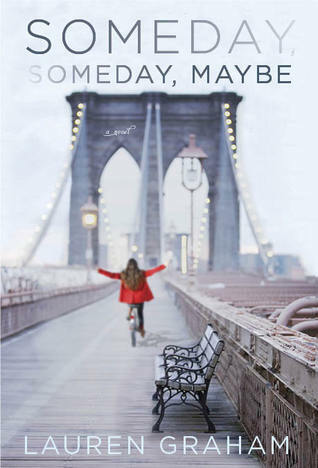 Someday, Someday, Maybe is such a cute book! So, a confession first before I begin: I’ve girl crushed on Lauren Graham forever. I was a huge Gilmore Girls fan and have followed her over to Parenthood (which I also love, even though every episode makes me cry.) That said, I opened this book with trepidation, unsure whether I would love it or be terribly disappointed. I am very happy to report that I loved it! Someday, Someday, Maybe is a fun, easy, enjoyable read about a young girl struggling to follow her dreams. I’m a sucker for a good self-growth story, so combining this with a follow-your-dreams plot, which I also love, left me smitten with this tale. I enjoyed Franny’s voice, so following her throughout the story was fun and provided many chuckles. I loved that we saw a different side of Hollywood and acting, how tough it is, and how much effort goes into it, because, like writing, I think many people feel it’s not very difficult to do. All of this combined with the throwback to the 80’s cemented my love for this novel. Reminiscing about a time when life did not have cell phones or smart phones, when fax machines were the latest in communication, when an answering machine was a black box by the phone, and a calendar was something you wrote in, was a fun trip down memory lane for me. Anyone who likes a coming of age story, or a follow your dreams one, and anyone who loves Lauren Graham really, will love Someday, Someday, Maybe. Thank you to Ballantine for our review copy. All opinions are our own.